YouTube Rep of the Week Asks 'Where Should The Money Go'? Your suggestions on health care reform ranged from giving all citizens the same health care benefits that Members of Congress receive to doing away with group insurance. And while Senator Grassley was not able to address all of these ideas, many of them are worthy of further exploration -- you can view the full list of ideas now at www.youtube.com/senatehub. Daniel Hannan, a Conservative member of the European Parliament from South East England, posted a video to YouTube, in which he chastises UK Prime Minister Gordon Brown at a meeting of the European Parliament in Strasbourg on Tuesday. Hannan attacked Brown for how he's handled the economy crisis, and told the Prime Minster that he was "the devalued Prime Minister of a devalued government," among other strongly-worded statements. The impassioned speech, uploaded to Hannan's own YouTube account, has nearly 1.3 million views and almost 9,000 comments at the time of this post. The President's Online Townhall: What did you think? Citizens in the Red River Valley, which spans across North Dakota, South Dakota, Minnesota and Montana, have been preparing for massive flooding for the past several days. The Red River has a history of flooding -- the last major flood was back in 1997 -- and this year is expected to be one of the worst in history. People and organizations on the ground have been posting videos to YouTube, capturing what conditions are like as the area prepares. The American Red Cross produced a video for residents with advice for how to prepare safely for the flooding. Many of these videos show the efforts of citizens working together to build walls of sandbags to keep the water out. Officials in Fargo, ND say that at least 2 million sandbags are needed to protect the city. User jennalee02 made a five-part video diary in Moorhead, MN showing the world what's going on there as residents prep their houses for the flood. Minnesota Public Radio did an amazing time-lapse video of people sandbagging in the "Fargodome" in Fargo, ND. As the river rises there will surely be more video footage uploaded to YouTube, so stay tuned. 1) Nick Kristof launched his "Win a Trip" with Nick contest, which invited students to apply to accompany him on his next reporting trip and used YouTube as a submission platform. The lucky winner was announced a few weeks ago. 2) The Times started a series called "The New Hard Times," which is focused on collecting memories and advice from Americans who lived through the Great Depression. They are inviting the community to submit videos of themselves or friends or family sharing their experiences from the Depression and offering insight for how to deal with today's difficult economic climate. Here's a video from June Reifstroffer Hammer, who was interviewed by her 13-year-old grandson, Samuel. Her account gets pretty emotional about 40 seconds in. 3) And finally, the Times did a "behind-the-scenes" look at President Obama's prime-time press conference from earlier this week. They gave those of us not able to attend the event in person a little taste of what it's like before the live, televised portion begins -- providing access where previously there's been none. This week, we launched a new "Call to Action" feature for YouTube nonprofit partners, which allows them to drive traffic from an in-video overlay to an off-site page where they can collect donations, signatures or email addresses. Already, we're seeing nonprofit organizations use this new feature with great success. 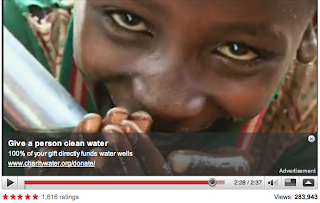 On Sunday, to commemorate World Water Day, we featured a video from charity:water on the YouTube homepage, which used a call-to-action overlay to encourage YouTube users to donate money to build wells and provide clean, safe drinking water for those who don't have it. The response from the YouTube community was overwhelming -- thanks to you, charity:water was able to raise over $10,000 in one day from the video. That's enough to build two brand-new wells in the Central African Republic and give over 150 people clean drinking water for 20 years! Feeling inspired? If you're a YouTube nonprofit partner, adding a call-to-action overlay is easy. Just go to "Edit Video" and fill out the fields in the section marked "Call to Action Overlay". Then click "Save" and the overlay should appear on your video. And if you're a nonprofit organization in the U.S. or U.K. who hasn't yet joined the YouTube Nonprofit Program, but would like to gain access to Call to Action and other special benefits, you can apply now at www.youtube.com/nonprofits. 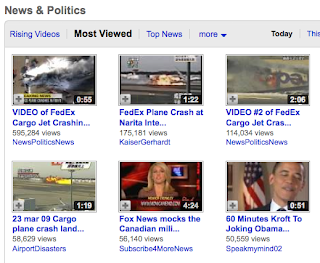 Take a look at the "Most Viewed" section of youtube.com/news today - and you'll see that there's one story dominating the thumbnail-dom: the FedEx plane crash in Tokyo. While this probably won't surprise you, what you might find interesting is that 2 of the top 3 videos are uploaded by the same user - NewsPoliticsNews. This plucky YouTuber has played the same game that so many other fair-use fanatics have played the past three years - uploading the most interesting bits of news to YouTube - but he/she/they(?) have been consistently hitting the tops of the charts. Look at NewsPoliticsNews' channel - it's chalk full of news clips from TV that have racked up hundreds of thousands of views (though the top clip, of a screaming crowd of would-be models at "America's Top Model") does look like it could have been shot by our mystery uploader. The success of TV rips on YouTube is not new. And we have a first-rate content ID system that allows original content owners to take down infringing material, or claim it as their own and run ads against it. Yet NewsPoliticsNews doesn't seem to be getting the attention of the networks, and is grabbing their audiences on YouTube with increasing effectiveness. CNN sure would have like to have picked up these extra 600K viewers. So who are you, NewsPoliticsNews, and what is your story? Citizentube would welcome a post - annonymous or otherwise. The U.S. Navy is using YouTube to document a dangerously close encounter they had with Chinese ships while running drills in international waterspace over the weekend. There are 8 videos, which can be found on the Navy's YouTube channel here. You can learn more from this post in Computerworld, where we discovered the story. We didn't even know the U.S. Navy had a YouTube channel... perhaps because the username, oddly, is "moritzdj". Some interesting analysis on vieweing of GOP YouTube videos vs. Democratic clips. 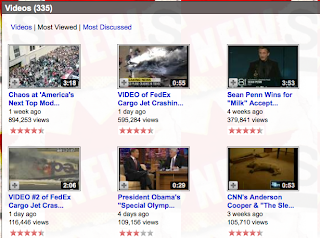 According to Tube Mogul in the Washington Times, the GOP is leading the view count race. Jacob Soboroff of Why Tuesday blogged about Massachusetts Governor Deval Patrick's use of YouTube to engage in a dialogue about election reform. Here's the post. The New York Times covered the real story and impact that the highly publicized Chris Brown and Rihanna incident has had on American Teens. "Yeah, men hit women, and women hit men. It was blown out of proportion because they’re celebrities," the Times quoted one 17-year old from Texas. Do Something had a different response from their teenagers - outrage. Do Something teen members created this reenactment video to show the incident without celebrities and tell the real story of teen dating abuse. Great piece in the New York Times today about how a woman in Saudi Arabia used YouTube to post a video of herself driving a car - an act of civil disobedience in a country where woman are not allowed to drive. Wajeha al-Huwaider, a Saudi women's rights activist, illegally drove her car for one minute along a public highway to protest in honor of International Women's Day. Check out the article for a full report and to watch the video. Jonathan Krohn received some big attention at CPAC this year and even found himself on the cover of the New York Times Style Section last weekend. Who is Jonathan Krohn? A 13 year old wunderkind for the GOP, whose dynamic speaking style and passion for conservatism has brought him a nationwide profile. At 13, he's just barely old enough (under YouTube's TOS) to start a YouTube channel to post his myriad of TV appearances, so his father Doug has taken to the task. You can see Jonathan on Doug's channel here. And, watch the speech that brought him national attention below. There's a whole lotta spending going on in Washington these days, and the Heritage Foundation has just launched a new YouTube contest and petition to raise concern. And they're using that time-honored hook to get you feeling guilty: child spokespeople. Check out the video below, and submit your video on govt. spending to the "Stop Spending Our Future" YouTube group. Winner gets 500 bucks. Van Jones, founder of YouTube nonprofit partner Green for All and leader of the green jobs movement, has just been appointed to the position of Special Adviser for Green Jobs, Enterprise and Innovation in the Obama Administration. Recent reports have indicated that Israel has overtaken Russia as India’s single-largest defense material supplier. Now Israeli arms firm Rafael is using YouTube to ensure that it gets a piece of the pie. Congressman Neil Abercrombie, representative for the 1st District of Hawaii, announced his candidacy for Governor of Hawaii via YouTube last Friday. He's already uploaded another video to his personal channel -- an informal address to his supporters bringing the message of hope and change from Washington D.C. back to Hawaii. Given his parallel announcements on Twitter and Facebook, it's safe to say Abercrombie is riding the wave of his state's hometown hero and taking a page from Obama's new media playbook. Spotlight on a cool YouTube channel doing innovative things with video in the developing world: Video Volunteers. This non-profit group is creating a self-described "CNN or BBC for the one billion people living on less than two dollars a day." Their idea is pretty simple, albeit not easy to pull off. Basically, they're trying to empower people living in slums and villages around the world by giving them the tools to produce video content. By enabling local communities to create videos telling their story with affordable video and editing equipment, Video Volunteers hopes to set up a "global community media network." Ever since Rush Limbaugh's comments last week that he hopes President Obama will "fail" in his efforts to revive the American economy, Democratic groups have been trying to portray the controversial conservative radio talk show host as the leader of the Republican party, which doesn't want to help America get back on its feet. Watch the latest ad from Americans United for Change, a labor-affiliated group in Washington D.C. The Caucus blog on nytimes.com calls this "yet another step in a choreographed campaign to affix Rush Limbaugh (using cement glue) to the Republicans." We're excited to launch Round 2 of "Senator of the Week" on YouTube's Senate Hub today, giving you another opportunity to use Google Moderator to offer Members of Congress your thoughts on the most important issues facing America right now. Congress is waiting to hear your thoughts on these issues, which are being hotly debated on the Hill right now, so head over to youtube.com/senatehub and youtube.com/househub and make your voice heard. President Obama has made his weekly Presidential Addresses a new YouTube phenomenon... but Democrats aren't the only ones taking to the tubes to get their weekly talking points out. Each week the GOP follows time-honored tradition and responds with their own address, posted by a different party representative each time. Here's the latest, from Senator Burr of North Carolina. The only challenge with the GOP's responses on YouTube is that they are posted to a different account each week, and can be hard to find... unless you're on the email list, or surfing GOP.com. They might want to consider posting them to a consistent channel each week so they can build a brand and subscriber base around the responses, like the White House has on youtube.com/whitehouse.